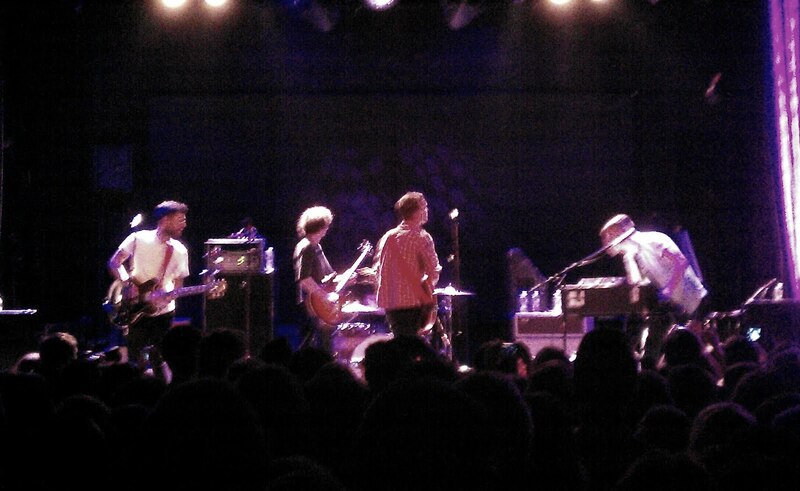 After 15 months since their last show, and 10(!) years since their inception, Steel Train returned to the stage for two nights at Maxwell's on January 4th and the Bowery Ballroom on January 5th. Opening for them, was Chaos Chaos, a band I had not heard about until this show and went online to do some research for the blog. I was surprised to find that they were none other than the band formerly known as Smoosh, from my hometown. With the new band, and new home base (Brooklyn, of course), their new sound brings a more confident spirit and electro-pop feel. 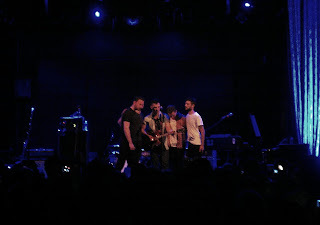 Their set featured songs off their debut EP, S and a cover of Tegan and Sara's "Closer", who they opened for last fall. I am digging their new sound and look forward to seeing what they have in store for the world. I have only seen Steel Train live once or twice before (and probably almost ten years ago), but it was nice to see that the atmosphere was still the same warm and inviting one, like you are being privy to watching the band perform for only their close family and friends. But being in the room full of loyal fans from over the years, including even those who traveled across the country for this show, it is safe to say that we, the fans, have become part of their family. They mostly played songs off their last two albums, Steel Train and Trampoline, though I know I was not the only one who was hoping they would play songs off the For You My Dear EP. (Guy in the audience: "For you my dear!" Jack Antonoff: "We'll be playing a lot of songs and there is some mystery as to what they are but I can tell you that that is not one of them".) 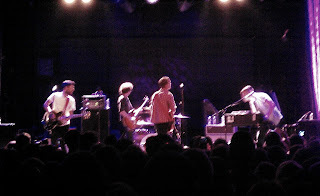 I was pleased though that they played "Better Love" and "Road Song", a very unique ditty, from Twilight Tales from the Prairies of the Sun, their first full-length album from 2005. It is probably safe to say that the chapter has closed on Steel Train's story, especially with their lead singer finding such commercial success with his new band, fun. But it was great to have the opportunity, for one night, to go back to their heyday, when we were young and felt the world was ours for the taking.